You must sign up for points BEFORE first round of eliminations for your points to count for the day. It is free to sign up, but you must sign up if you weren't in the main series. Test & Tune is limited to 3 passes on Sunday. 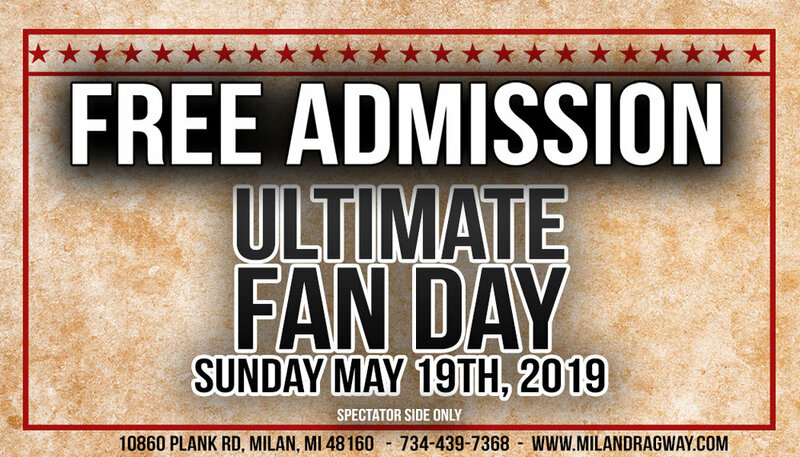 Fan Day: Come on the spectator side for FREE and watch Fleet Doctor Sunday Bracket Points Series and Great Lakes Gassers. There are 4 classes in this series: Super Pro, Pro, Sportsman and Super Pro Bike. Bracket Racers: Gates open at 9 AM | Time Trials at 10 AM | Eliminations around 12:30 PM Pro & Super Pro $45 | Sportsman & Super Pro Motorcycle $35 | Spectators $15 You must sign up for points BEFORE first round of eliminations for your points to count for the day. It is free to sign up, but you must sign up if you weren't in the main series. Test & Tune is limited to 3 passes on Sunday. Gates open at 9 AM | Time Trials at 10 AM | Eliminations around 12:30 PM Pro & Super Pro $45 | Sportsman & Super Pro Motorcycle $35 | Spectators $15 Test & Tune is limited to 3 passes on Sunday. 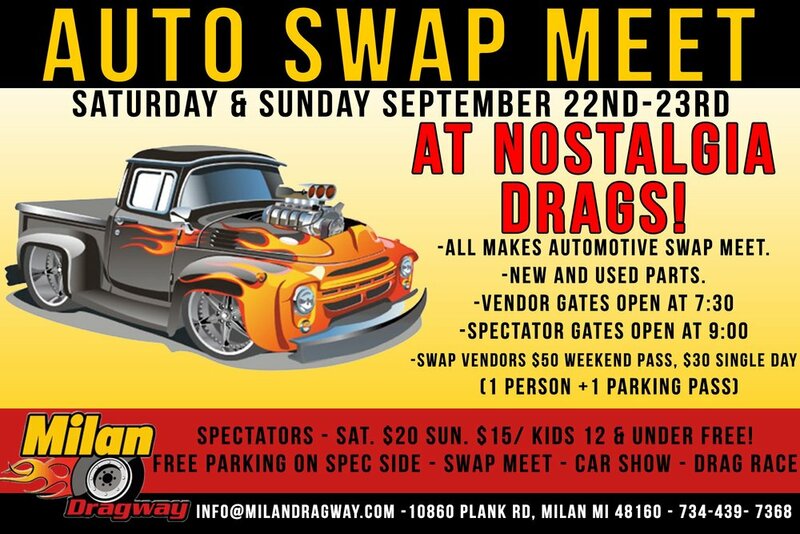 Nostalgia Drags ~ Funny Car Shakedown is a fan favorite event! Friday 9/21 we kick off the weekend with Nostalgia Testing and a Gamblers Race. 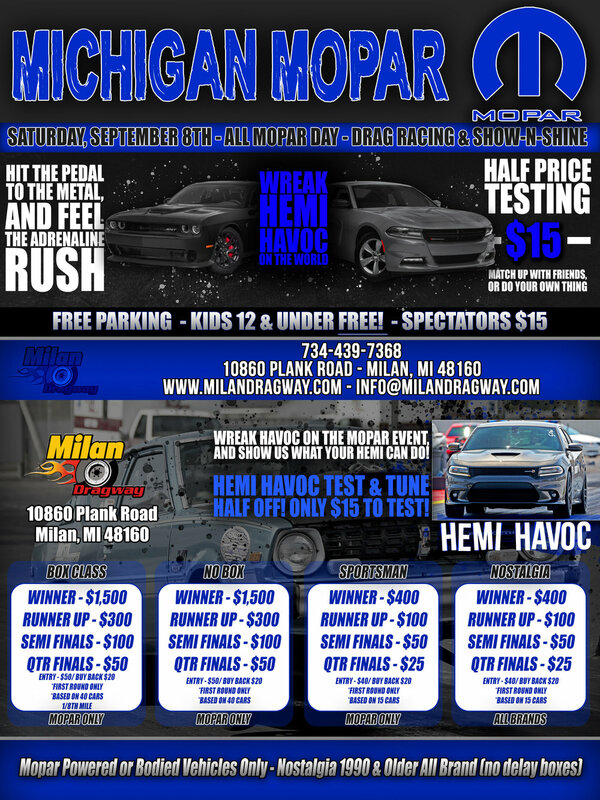 Saturday 9/22 Nitro Funny Cars, Alcohol Funny Cars, Great Lakes Gassers, multiple racing classes, Car Show and Huge Swap Meet! 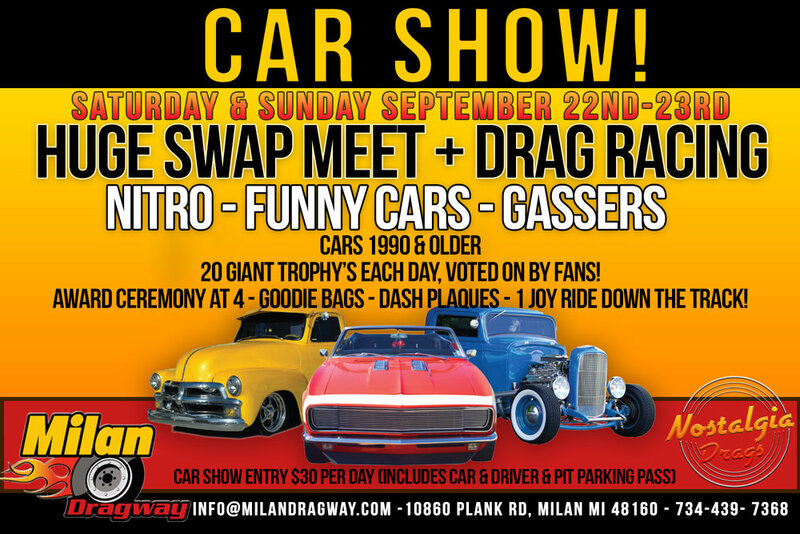 Sunday 9/23 Nitro Funny Cars, Alcohol Funny Cars, Great Lakes Gassers, multiple racing classes, Car Show and Huge Swap Meet! 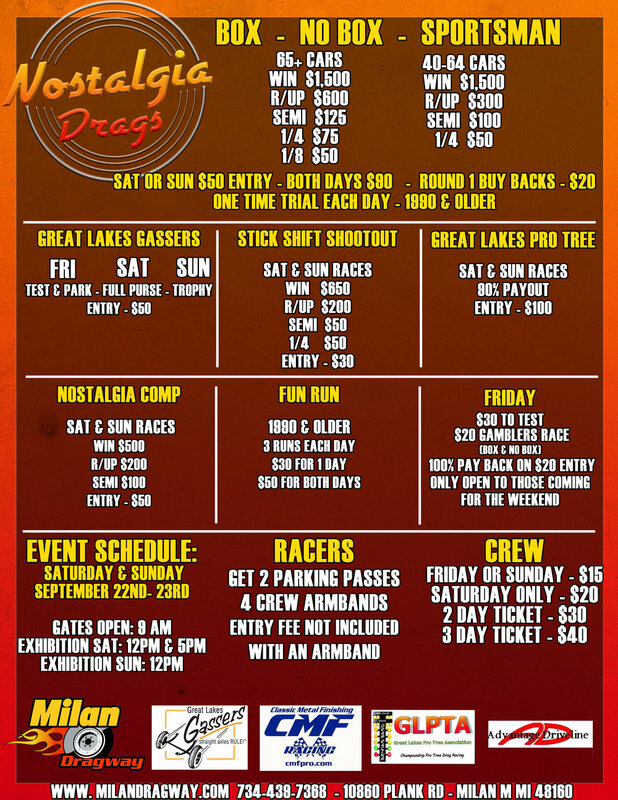 Gates open at 9am Saturday and Sunday. All cars must be 1990 or older to run this day. Gates open at 9 AM | Racing starts at 10 AM | $15 to watch | Kids 12 & under are FREE! Fleet Doctor Bracket Points Race #8: Gold Card Race!